Carfraemill is a flexible wedding venue, great for both intimate weddings with close friends and family, and large and lavish celebrations. It has its own fantastic lined marquee with pine floor, which is suitable for gatherings of up to 300 guests, and is brilliant for dancing! The marquee is a great option for dressing up to suit your own style, and Get Knotted can help out with our beautiful range of wedding props, lights for hire and also our flower styling. Here’s video of the marquee being styled. 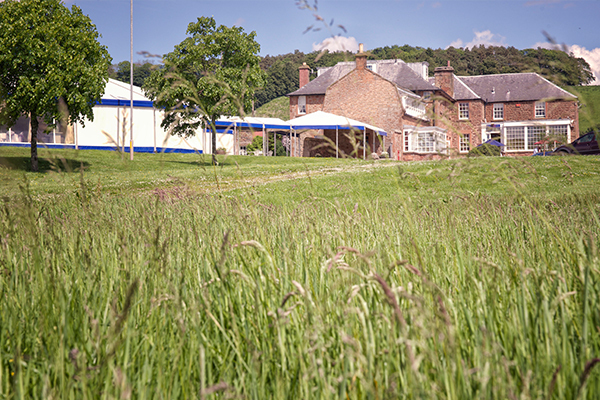 The team at Carfraemill are passionate about fabulous food and local produce, so you can be sure of the best seasonal and farm-to-fork ingredients in the Scottish Borders – great news if you and your guests are dedicated foodies! Carfraemill has ten beautifully appointed boutique-style bedrooms, with plenty more further guest accommodation only four miles away in Lauder. It’s easy to get to on the A68, just 20 miles south of Edinburgh, and makes a great starting point for exploring the lovely walks and market towns of the Scottish Borders. The Carfraemill warm Scottish welcome also extends to younger guests. It’s very family-friendly and baby-friendly, with cots and folding beds for younger guests, as well as a special children’s menu for junior foodies! Carfraemill offers some great packages for country weddings with relaxed fine dining.